The physics of materials with strong electronic correlations is remarkably rich and complex and cannot be understood within the conventional theories of metals and insulators. In correlated materials, charge, spin, orbital and lattice degrees of freedom result in competing interactions. 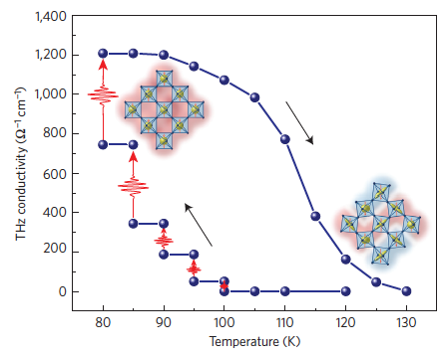 These lead to phase transitions and the emergence of exotic phases including the pseudogap state in cuprates and manganites, high-temperature superconductivity, charge stripes in cuprates, even phase separation in some manganites and cuprates. 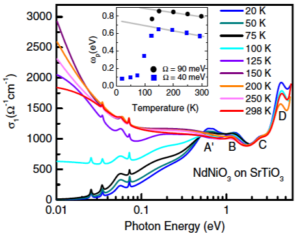 By harnessing a nanoscale optical probe of the local electronic conductivity, we reveal two physically distinct yet concurrent low-temperature phase transitions in the rare earth nickelate NdNiO3. Whereas the sample bulk exhibits a first-order transition between metal and insulator phases, we resolve anomalous nanoscale domain walls in the insulating state that undergo a distinctly continuous insulator–metal transition, with hallmarks of second-order behaviour. We ascribe these domain walls to boundaries between antiferromagnetically ordered domains within the charge ordered bulk. The close correspondence of these observations to predictions from a Landau theory of coupled charge and magnetic orders highlights the importance of coupled order parameters in driving the complex phase transition in correlated electron materials such as the rare earth nickelates. The insulator–metal transition remains among the most studied phenomena in correlated electron physics. 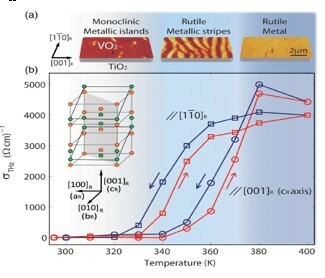 However, the spontaneous formation of spatial patterns amidst insulator–metal phase coexistence remains poorly explored at the meso and nanoscales. 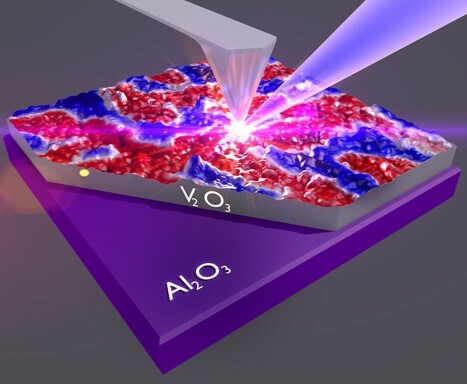 Here we present real-space evolution of the insulator–metal transition in a V2O3 thin film imaged at high spatial resolution by cryogenic near-field infrared microscopy. 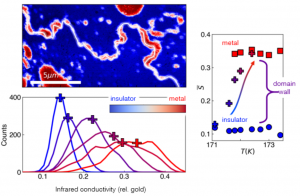 We resolve spontaneously nanotextured coexistence of metal and correlated Mott insulator phases near the insulator-to-metal transition (160–180 K) associated with percolation and an underlying structural phase transition. A quantitative analysis of nano-infrared images acquired across the transition suggests decoupling of electronic and structural transformations. (with R.A. Averitt) Zhang et al. Nature Materials 15, 956 (2016). Article . A major challenge in quantum materials is active control of quantum phases. Dynamic control with pulsed electromagnetic fields can overcome energetic barriers, enabling access to transient or metastable states that are not thermally accessible. Here we demonstrate strain-engineered tuning of La2/3Ca1/3MnO3 into an emergent charge-ordered insulating phase, where a single optical pulse can initiate a transition to a long-lived metastable hidden metallic phase. Comprehensive single-shot pulsed excitation measurements demonstrate that the transition is cooperative and ultrafast, requiring a critical absorbed photon density to activate local charge excitations that mediate magnetic–lattice coupling. Liu et al. Physical Review Letters 111, 096603 (2013) . Article . Stewart et al. Physical Review Letters 107, 176401 (2011). Article . An optical study of NdNiO3 ultrathin films with insulating and metallic ground states reveals new aspects of the insulator-to-metal transition that point to Mott physics as the driving force. In contrast with the behavior of charge-ordered systems, we find that the emergence of the Drude resonance across the transition is linked to a spectral weight transfer over an energy range of the order of the Coulomb repulsion U, as the energy gap is filled with states instead of closing continuously. 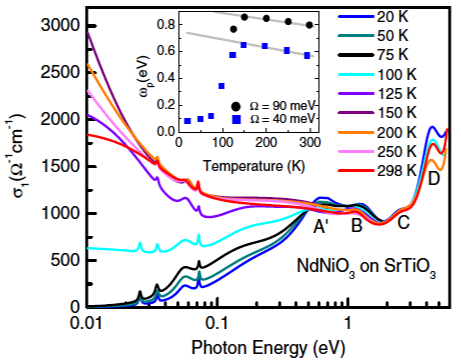 The simple band picture based solely on charge-ordering fails to account for the salient spectral properties of NdNiO3 and Mott physics must therefore be taken into account to fully describe this correlated system.